Most breast cancers (BC) are endocrine responsive and endocrine therapy (ET) represents the mainstay treatment in all disease settings. 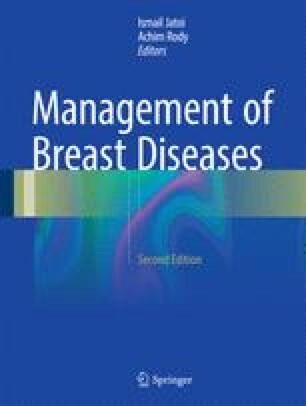 In the adjuvant setting, in premenopausal women, tamoxifen is the standard in low-risk patients, providing a significant reduction in both risk of recurrence and BC mortality; the addition of ovarian function suppression (OFS) to tamoxifen or the aromatase inhibitor (AI) Exemestane is recommended in patients at higher risk of relapse. In postmenopausal patients, both tamoxifen and AIs are effective: AIs demonstrated an improvement in disease-free survival and a modest benefit in overall survival. In locally advanced breast cancer, in postmenopausal women, AIs are more effective than tamoxifen in tumour shrinkage to facilitate conservative surgery. Few data are available in premenopausal women, for whom primary ET is not recommended outside of clinical trials. In the metastatic setting, ET should be preferred over chemotherapy if rapid disease response is not needed. In premenopausal women, the standard first-line therapy is tamoxifen plus OFS. In postmenopausal women, first-line treatments include AIs, tamoxifen, Fulvestrant and megestrol acetate. The optimal drug sequence after first line depends on treatment received in the neoadjuvant and first-line ABC settings. Promising results are accumulating with CDK4/6 inhibitors both in pre- and postmenopausal women .